The basic principle governing captive sequential key interlocking systems is the ability to lock equipment in the desired position allowing removal of the key, which, in turn, can be used to lock or unlock related equipment in a sequentially predetermined manner. The key interlock is interfaced to the equipment operating mechanism (handle, linkage, rotating cam, or similar) in such a way as to facilitate the locking and key release requirements. Auxiliary switches, solenoid devices, and an array of ancillary options are available to fully integrate our interlock system with process control equipment. In general, key interlocks can be applied to any equipment, which must be operated in a predetermined sequence to insure the safety of the operator and continued integrity of the equipment. 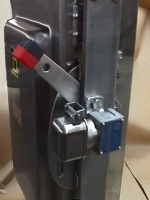 Key Interlocks are a relatively inexpensive method for protecting equipment. The installation of the interlock is always made local to the equipment to be protected. The key serves as the only tie between the interlocked mechanisms and is only removable when conditions are safe to continue with the sequence. They are a simple design element to incorporate into OEM equipment, and are especially useful when there are considerable distances between related pieces of equipment. A key interlock system becomes a useful operator-training tool as it forces the operator into a regimen, which cannot be circumvented. Furthermore, key interlocks can compliment and work within the bounds of a lockout/tagout system. Where a lockout/tagout system is dependent on written procedures and operator knowledge to prevent incorrect operation of related equipment, a key interlock system will not allow unsafe operation of equipment due to operator inexperience or misinterpreted written procedures.